I (Alexa) do not graduate until next December, but this upcoming spring will be my last season playing Lacrosse.It is a bitter sweet feeling. My love for competition and lacrosse will last forever, but this high level of play will soon come to an end unfortunately. Although Lacrosse is very tough mentally and physically I am going to miss the competition and hard work. On the other hand it will be refreshing to come back to school in the fall and not have to wake up at 6 am every morning to work out. Once I graduate I plan on going to nursing school in Boston. Not sure which school yet, but I am working on that! I have heard many great things about Boston as a city and am excited to embark on a new journey. My Cousin Maddie lives in Boston now and I plan on moving in with her for about two years. After I complete nursing school I would love to become a traveling nurse and travel the world 🙂 Why not travel and work at the same time right? If I could choose I would love to become a nurse abroad and travel through Europe. That is my dream. Once I graduate (Kelsey) I am going to pursue a career as a sports broadcaster. Being in dance all of my life and going to many different events I find great interest for other sports as well as my own. If had to choose which sport I would want to broadcast I would definitely say it is a close call between basketball and football. All of my college career I have been dancing at their games and have become very familiar with both sports and have really grown to love them. Like I mentioned in my earlier post growing up I used to go to my twin brothers sporting events all of the time so I have been a customer to both of them sports for a while now. It would be my dream to become a well known woman broadcaster in the 21st century. We just wanted to say thank you for reading & hope you enjoyed our college athlete blog! Hopefully you could take something away from one or more of our posts! Today’s agenda: In this post we are going to talk about how men and women are treated differently when it comes to sports and athletics. Being a female athlete we are familiar with this topic, and have experienced and seen many of the struggles that most female athletes endure on a daily basis. This includes women athletes’ salaries compared to men’s, how women sports are broadcast, and how women athletes are portrayed in the media. A 20-year study of network and cable by USC & Purdue sociologists find men take 96% of sports news. Women’s sports accounted for less than 2 percent of network news and ESPN Sportscaster. Interviews with women athletes typically tend to focus on their appearance and personal lives rather than their sport and how they played. Men rarely get asked these types of questions. A video created by Cover the Athlete demonstrates male athletes getting asked questions females typically get asked. It proves the sexist portrayal of females in the media and how popularity revolves around appearance. A perfect example of this is soccer player Alex Morgan. She is widely famous and idolized by many, a huge part due to her appearance. Teammate Abby Wambach actually has better statistics than Morgan, but does not have the same popularity due to her physical appearance. Inequality in women sports also is an issue in college. The fan base at women’s games compared to men’s games is drastically different in all sports. 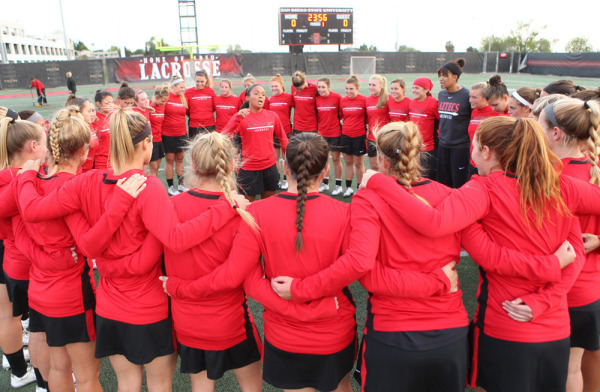 Many of the women’s teams at San Diego State are extremely successful, but many students are not aware. We feel as though it is important for students to support all athletes at their school and cheer them on at games. This post is going to focus on all of the outside support we have gotten to get to the points in our careers we are at today. Obviously, a lot of our success has come from our own hard work and dedication, but we couldn’t have done it without the support of our family and coaches! Like most young girls, my mom (Kelsey) signed me up for a dance class when I was about three years old. I was extremely shy as a child, so my mom was open to getting me involved in activities so I could meet some friends and break out of my shell. It definitely helped and from then on out, I was the one begging my mom to let me take more classes! A lot of people assume if you’re a dancer that your mom is a “dance mom”. My mom couldn’t be more opposite! While she is at every one of my competitions and performances, I was always the one asking to do more and become more serious about dance. I started dancing at a studio near my house up until I was about seven, and then convinced my parents to let me switch to a studio about thirty minutes away that some of my friends went to and was way more intense. This was the studio that really shaped me as a dancer, so I’m so thankful my parents supported me and took me to and from practices everyday and to all my competitions and performances. Also, dance is really expensive…from studio tuition costs, to competition fees, to costumes and shoes, to travel expenses, the list goes on. I obviously couldn’t have done any of it without my parents’ help and I know it hasn’t always been easy. They always do everything they can to help me follow my dreams and I can’t thank them enough! Kelsey with her parents at an SDSU Football Game. Another huge supporter of my dance career was my coach, Amber O’Brien. Amber started teaching me my freshman year of high school when I switched studios. Having her as one of my coaches really shaped me into the dancer I am today. She worked with me privately and pushed me to my fullest potential which I think is the reason I made the Dance Team here at San Diego State. Amber basically became like a big sister to me and it was so sad when I graduated and she was no longer my coach. But we still talk all the time and she gives me the best advice for dance and for life! 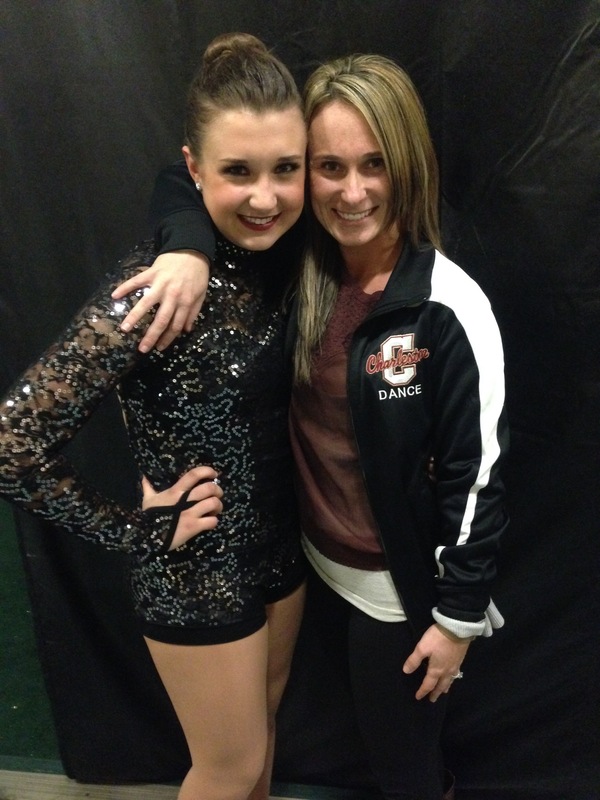 Kelsey and her former coach Amber. Alexa and her mom after one of her games. If you do not have a strong support system my advice to you is GO for it. If you want something bad enough you need to fight for it.Create a support system with the loved ones around you. If you know you want to play a sport in college do everything you are capable of doing to pursue your dream. Work hard train hard and get yourself noticed. You are your own personal advocate, sell yourself and make the coaches know how badly you are willing to fight and work for your goal. Here is a book that we found that came in handy as a competitive college athlete. And may help you become the best team player you can be. Our next post will be focusing on interviews with other members on our teams and their individual experiences as a college athlete. First, I (Kelsey) interview my teammate Shana Ned, who is a fifth year member of the Dance Team, and a team captain. What made you want to pursue dance at the college level? I have been dancing since I was three years old and dancing competitively since I was six years old. Dance became such a huge part of my life as I grew up. I danced every day, and competed on the weekends. When thinking about where I wanted to go to college, I could not imagine not dancing or taking dance out of my life so I decided that I wanted to go to a college with a competitive dance team. This is what made me want to pursue dance at the college level. What was the try-out process like? To be on the team, we have a two-day tryout. We are required to learn two routines off YouTube before attending the auditions. We receive a number on the first day of the audition. The first day of auditions consists of review of the routines that were learned on YouTube, across the floor to showcase dance technique, and a first cut. The second day, we arrive in the morning, and learn a completely new routine (for a total of three routines). Each routine is about 1 minute long. After we learn the final routine, we get one hour to review, and freshen up before we audition for the judges. The judges that are brought in do not know anyone on the team, to remove any amount of bias that may be present when choosing the team. We are separated into groups of three based on our numbers. Each group of three goes into the audition room, and performs the routines for the judges. The judges may ask you to perform the routines again, show them a specific trick, or ask you an interview-type question. It is different for each group. After each group auditions, the judges make a “yes” list, and “no” list, and a “maybe” list. The girls on the “no” list are dismissed, and the “maybe” group is brought back into the audition room. At this time, the judges can ask this group to do anything they want to see. This can be the routines or a type of trick of some sort. Once the judges narrow down the “maybe” group, they dismiss the dancers and deliberate on who they want to be on the team. Once they decide this, they call everyone that is left into the audition room, and announce who has made the team. It is a very long and tedious process. We are a highly competitive team and want the best team members. Technique, performance, overall look, spirit, and attitude are all deciding factors when choosing the team. How do you manage your time between dance and academics? It is challenging, but not impossible to succeed in both dance and academics. I feel as though I need both to have balance in my life. Having a busy schedule has taught be a lot about time management and how to be organized. If I have a few hours in between class and practice, I know that I need to get my work done in that time frame, before practice starts. Going to practice is a good brain release from schoolwork. It is a good way to clear my mind and not stress about what is going on in my academics. If I did not have dance to keep me on my toes, I actually think I would procrastinate more with my academics. As long as you stay organized with both dance and academics, managing time between the two is not hard! Being on the dance team is a very big time commitment. When the season begins, we attend two dance camps; one in Palm Springs and another in Santa Barbara. A week before school starts, we practice every day for about 9 hours to prepare for all of the welcome week events on campus. When school starts, we practice regularly, three times a week, for a total of 10 hours. We perform and cheer at all of the home football games during the first semester of school. If there is a football game, we add another 2-hour practice the day before the game. We also perform and cheer at all home basketball games, when their season starts. Sometimes those games are during the week, or on the weekend. We are also a competitive dance team. 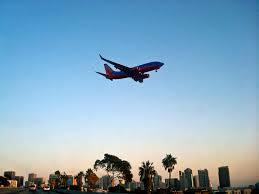 We compete in January in Orlando, Florida and also in Anaheim in Orange County, California. In order to prepare for this, during Christmas Break, we stay on campus and practice about 8 hours every single day for two weeks, leading up to our competition. We also do community service events, media spots, athletic promos, and basically anything the San Diego community wants us to attend year round. We do not have a specific season, we are a year-round team. What are the biggest challenges of being on a college dance team? I think one of the biggest challenges of being on a college dance team is finding enough time not only for school, but for family, friends, and other things in life that are important. There have been many times where I have had to sacrifice certain things, or not attend family parties because I have a dance event or practice. Although it is tough sometimes, dance team is something you sign up for and if you do not like the time commitment, then you are free to quit. The coaches are also good about allowing us to miss certain things, if we need to be somewhere that is important to us. We have to give the coaches a big notice if we are ever going to miss something though. What are your biggest accomplishments as a member of the team? One of my biggest accomplishments as a member of the team is being the only 5-year senior this year, and the only person to be captain for three years. What are your favorite memories being on the team? I have so many amazing memories from being on the team. I will start with my freshman year. We were given the opportunity to travel to New Orleans with the football team, to cheer them on at their Bowl Game. That same year, I was able to travel with the basketball team to Columbus, Ohio to cheer them on in the first round of March Madness. My junior year, I traveled to Boise, Idaho with the football team for their Bowl Game, and Spokane, Washington for the first round of March Madness for the basketball team. Last year (my senior year) was probably the best year I have had being on the team! When we went to nationals in Florida, we placed 4th in the nation for Jazz and 7th in the nation for Hip-Hop. The year before this, we didn’t even make finals or place in the top 10, so this was a huge accomplishment for us. Also, when we went to our second nationals in Anaheim, we placed first in both the Jazz and Hip-Hop divisions. This was such an amazing feeling because it had been four years since our team had placed first at that competition. These are the highlights of my time on the dance team and I am so excited to see what my last year has to bring! 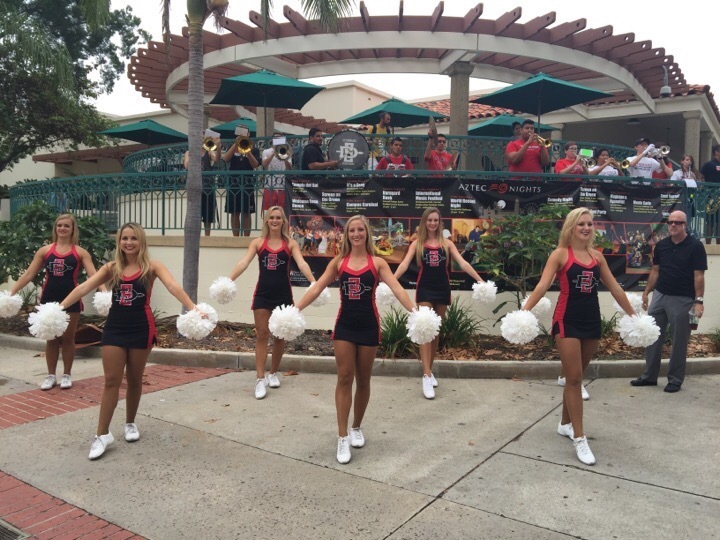 Shana Ned ready to perform at an SDSU Football Game. Now I (Alexa) am going to interview one of my teammates Sarah Dorl. 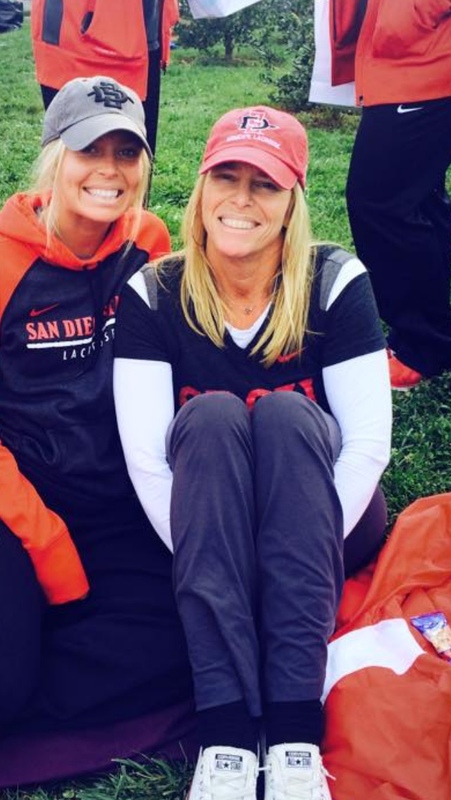 She is a Junior on the SDSU Lacrosse team and plays attack. (for those of you who don’t know that is an offensive position). What made you want to pursue Lacrosse at a college level? What is the time commitment required for this sport? Basically 6 days a week, with some Saturdays off. We get up early in the morning and condition and practice in the fall then after practice we go right to out classes. In the spring, we practice during the day from around 12-4. And travel a lot more often. How do you manage your time between Lacrosse and school? It is a tight schedule. When I am not playing I am usually studying. My major (Kinesiology) is very time consuming and to remain a scholar athlete, my studies require a good about of my time. 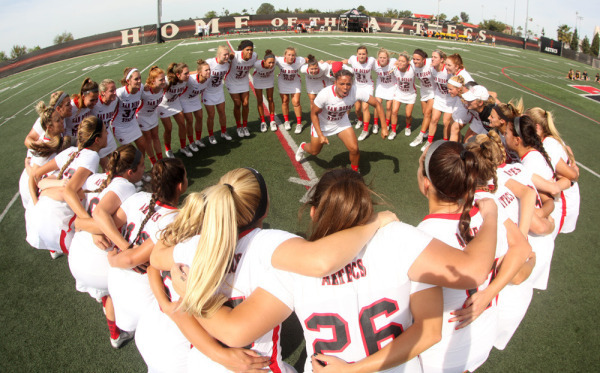 What are the biggest challenges of being on a college Lacrosse team? The time commitment and dedication. No matter how I feel or how tired I am after practice we still have to be alert ready to learn. Because our day is not over when practice ends, we still have our studies we need to take care of as well. What are your favorite memories being apart of the team? My favorite memory is when we go to Maryland in the fall and I get to see my family and play with all best best friends in my hometown. We also go to this awesome bagel place and get the best bagels EVER! I recommend the city girl and the country boy! They are a big hit in Maryland. In this post we are going to be discussing the importance of nutrition and diet for college athletes and what we do to ensure we are fueled for our best performance! So as we discussed in our last post, being a college athlete means you constantly have a busy schedule. Cooking a healthy meal is the last thing on our minds after a busy day or hard practice. But maintaining a healthy diet is necessary for all college athletes to be successful and is something we always have to be aware of. Many college athletes aren’t properly educated on what to eat and when to eat it. Water also plays a huge role in being a healthy college athlete. While this seems obvious, many athletes are not drinking enough water to keep their bodies’ fully hydrated during practices and games. 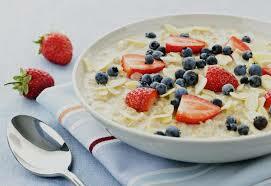 As a dancer (Kelsey), I have always had to be aware of watching what I ate and maintaining a healthy diet. My coaches have sat us down on multiple occasions and informed us of the importance of nutrition and has brought in nutritionists to give us ideas and the proper information on eating to benefit our bodies. Figuring out what to eat and when to eat it depends on the day. We have met one on one with our trainer and he discussed the necessary steps each of us needs to take to maintain a healthy, fit body that will get us through everything from games to the rigorous competition season. On a typical day, I make sure I limit my intake of unnecessary sugars and fats. 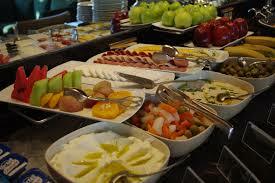 For breakfast I typically have egg whites and a piece of toast (and coffee of course!). For lunch I try to switch it up and will have anything from yogurt with granola and fruit to a salad or a smoothie. For dinner I will have some grilled chicken, rice, and vegetables. Game days or competition days are a little different and we all need to load up on carbs and protein to make sure we have enough energy for the day. As a Lacrosse player (Alexa), Nutrition plays a HUGE role in my life. Not enough fuel or not the right kind of fuel can really alter my performance. For example, when we have practice and conditioning early in the morning it is very crucial that I eat something even though my body doesn’t feel hungry. 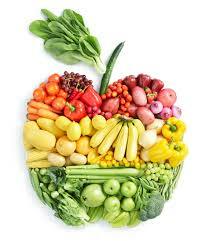 Food fuels our body and without fuel you simply can not perform to your fullest potential. Click here and read the top 10 nutrition facts that everyone agrees about! As a college athlete, it is difficult to prepare a solid healthy meal because we are always in a rush. What I have been taught to do is prepare the meals ahead of time so when I wake up all you have to do is pull it out of the fridge and head to practice. Although it can be frustrating to make all at one time, it pays off when you don’t have time and need to grab something quickly. Eat well, feel well, perform well. As a lacrosse player (Alexa) our season is in the spring. Therefore all of our workouts and practices are in the mornings. When season comes around our schedule flip flops and we practice later in the day. Having practice in the morning is convenient at times and inconvenient at others. In the fall the alarm clock is my best friend. I am not a morning person so this aspect is very hard for me! I love my sleep and getting out of bed is the last thing I want to do when my alarm goes o ff at 6 am. This is where flexibility comes in. Being a college athlete you have to be flexible and adjust to things you are not used to. Because of our morning workouts, we as a team, schedule our classes in the afternoon. So after our workouts/ practice we shower (if we have time.. don’t judge!) and head to class. This is where the caffeine comes in. For me it is hard to concentrate if I transition fast from practice to class and I usually need a little energy boost (coffee or some food) to help me focus. After class I go home and either run some errands (grocery shop) or relax for a little before I start to make myself dinner. Sometimes in the evening I have plans, but my favorite days are the days I get to go home and “veg out”. Also like every other college student, we get homework which also takes up a good chunk of our night. So pretty much there is not much time to be social. If I want to do something fun or go out to dinner that is something I usually have to plan days in advance. Growing up as a competitive dancer (Kelsey), I have always been used to having a hectic schedule. I’m extremely lucky to have amazing, supportive parents who did everything they could to help me out whenever I needed. Like any high schooler, I was used to having my parents make me food when I got home from practice late and wash my uniforms last minute when I needed them the next day. So coming to college and not having their constant help was a definite change. Dance Team basically has a never ending season. Once we start in July we don’t have a significant amount of time off again until the school year is over in May. During fall semester, our main focus is performing at football games and also starting our routines for competition. Spring semester is the peak of competition season along with basketball season. An average week for a dance team member consists of struggling to wake up for class everyday after a late practice the night before. We practice during the week from 8pm to 11pm and Sundays from 5pm to 9pm. So while we usually have the whole day to go to class, do homework, run errands, and do whatever we need to do to get our lives together before practice, it is always stressful to prioritize and get everything done. Besides being at all football and basketball games, we almost always also have at minimum three other events or appearances during the week. This can consist of walking through campus with the band to promote this week’s game, performing and working at community events, and even just posing for pictures. Sometimes it takes us longer to get ready for an event than the time we are actually there! Any place that needs Aztec spirit and entertainment, we are there. Dance Team performing on campus welcoming students back during the first week of school. Once competition season gets started, our schedule gets even crazier, sometimes with extra or longer practices. We have to make sure we are prepared for every event, performance, game, and competition; all while acting like we have it all under control, when most of the time we don’t! We always say you have to fake it ’til you make it. Sometimes I look at my schedule for the week and get stressed and overwhelmed. I have to prioritize on assignments and make sure I plan a specific time to get everything done. I always try to squeeze in some time where I can relax or have some fun with friends. I have friends who look at my calendar and wonder how I get everything done. While it can be super stressful at times, I wouldn’t change it for anything! Working under pressure makes me more productive because I know I have no time to procrastinate. Dance Team practicing for their performances at the first Football Game. Check back soon for an update on how we stay healthy and eat right as college athletes! Our first post will be dedicated to PREPARATION when becoming a college athlete. We are going to talk about ways to physically, mentally, and emotionally get prepared for the greatest and hardest four years of your life as well as our journeys in becoming athletes here at San Diego State. We are not going to sugar coat things, this will be a difficult journey but in the midst of the difficulty you will have so many rewards and accomplishments that it will be well worth it! Just be prepared to WORK! In high school I (Alexa) was on my varsity lacrosse team since I was a freshman and our league was not enough to get me scouted by college coaches, so I decided to joined a club team my freshman year as well. The club team I played for was called T3, based out of New Jersey where we practiced a couple times a week and had tournaments up and down the east coast over summer. It was very enjoyable and I made a bunch of friends through it as well. This program was what inevitably got me into SDSU, which I am forever grateful to the coaching staff and program. After coming on an official visit to SDSU, I knew I wanted to be a part of this great program and I committed to SDSU during one of our home football games. From then on I was an Aztec for life. It was crazy yet empowering going back to high school the next week already knowing what was in store. This is where the preparation comes into play. I knew I had to train and prepare myself for the next level of play. College sports, as most of you know, are much more fast pace than high school sports. In high school you are used to being the superstar of the team, but once you get to college everyone on the team was their high school’s superstar, It was a little challenging coming in knowing everyone was on your level or better. I (Kelsey) took my first dance class at the age of 4 and fell in love. From then on I grew up in the dance studio, taking classes sometimes up to 30 hours a week and competing every weekend. I earned at spot on my high school’s dance team starting my freshman year and continued on the team until my senior year, where I was captain of the team. During high school I also continued to dance and compete with a studio, which is how I feel I was able to grow to my fullest potential and continue to be pushed. Towards the end of my senior year, I knew it could possibly be my last year dancing, and with all my years of work and accomplishments, I knew I didn’t want it to come to an end. With the support of my coaches, I decided I should take the next step and try out for collegiate dance teams. 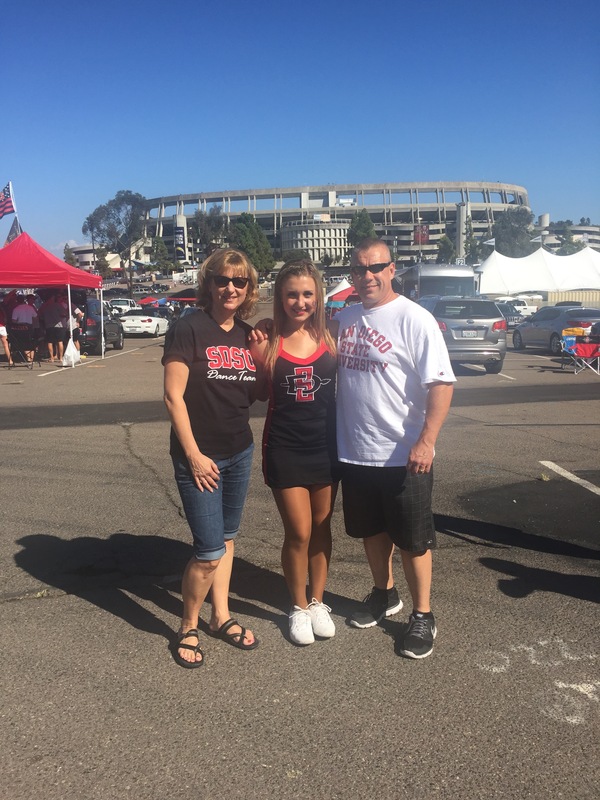 After following SDSU’s Dance Team online, I tried out for the team and was thrilled to earn a spot after competing with almost 100 other girls. After making the team I had to work to be sure I was at the same level as the returning members of the team. This includes matching their style, mastering new tricks, and of course staying in shape. Like Alexa, coming from a team where you were the star, to a team where everyone is the best is eye opening and definitely pushes you to work harder than you ever have. Step 1. 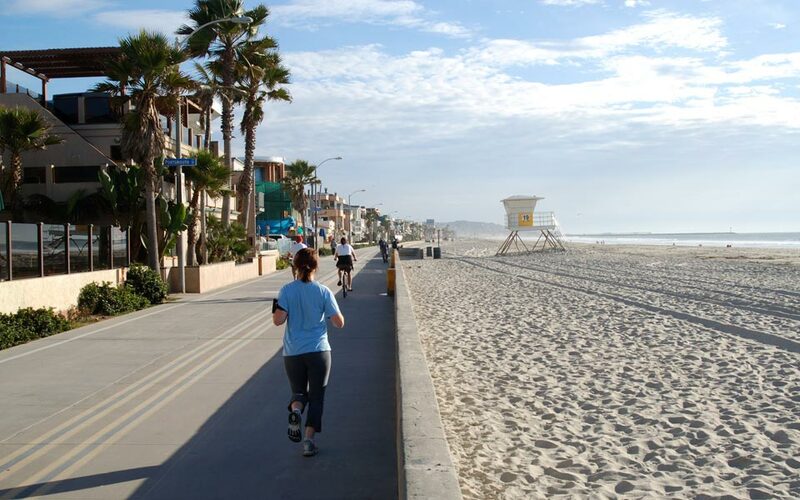 Physical: Continue to stay in shape! Work out and follow the regiment. If your coach gives you a packet to prepare you better follow it! This is probably the most important aspect of being a college athlete. It is almost an unspoken rule that you come in ready to work! Step 2. Mental: Being mentally tough is very difficult. It is easy to sike yourself out if things start to get rocky. Self positive talk is very important and proves to your coaches that you are a well rounded player. They want to know that when things get tough you are in it no matter what. More often then not in life we are our own worst enemy. There are little things that can help you such as positive notes or quotes where you can read them and remind yourself that you are here for a reason and are mentally tough and will get through it. Also it is good to have someone that keeps you accountable and lifts you up. If they see that you are struggling it is there job to pick you up and give you some positive talk. Step 3. Emotional: College is hard! Yes it is fun, but with fun also comes responsibility, hard work, and stress. Many tears will be shed but it is what you do after that matters most. Like we said before have someone that you can go to who will pick you back up and be there for you when you are struggling. Being on a team you have an instant couple dozen friends that will be there for you. Do not be afraid to ask for some support. On a side note, if things get too serious seek professional help, do not be embarrassed because it is better to catch these feelings early then let them overpower you. We hope this post helps prepare you and if you have any input or comments you would like to make please feel free to comment below!